Well-equipped back machines are equipped with a higher functionality increasing the variety of exercises. While equipment features like integrated lifting handles or folding mechanisms improve the handling, comfortable upholsteries facilitate the training. This criterion considers the adjustment options of single units to the user and the general ergonomics of the back machine. An ergonomic construction with correct joint angles prevents physiological false postures. This movement criterion mainly focuses on the quality of the accomplishment (due to friction resistances, storages, ergonomics, etc.). A constant course of motion is very important for back training. Such a movement is joint-gentle; the training effect is improved thanks to an increased muscle activity. The stability of a back machine is achieved by the size of the floor space, a high own weight, and a sturdy frame construction. A sturdy back machine is not only durable; it is safe and offers a higher weight loadability. 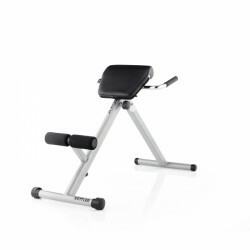 Train your back muscles with the Kettler training bench AXOS Back-Trainer - comfortably at home. By adjusting the hip pad, you find easily your correct training position and can start quickly your workout. A compact, but sturdy construction allows a user weight up to 130 kg. The large feet provide a safe stability.